Curses, Aleister Crowley and Tutankhamum. And now for this week’s news from the Egypt Centre: a story of curses, Aleister Crowley and Tutankhamum. Whilst trying to document more about our collection I noticed that we had some objects which once belonged to Richard Bethell (1883-1929). ‘Who was he?’, I thought. Bethell was Lord Carnarvon’s half-brother, Howard Carter’s secretary and a member of the Burlington Fine Arts Club. The latter were instrumental in categorising ancient Egyptian artefacts as art in the late 19th century. Interesting stuff on the history of art there, but I digress. Richard Bethell was also the son of the Third Baron Westbury. Author Mark Beynon claims he was murdered by, or at the behest of, the famous satanist Aleister Crowley[i]. Richard Bethell, was found dead in his bed at Mayfair's exclusive Bath Club aged just 46. Bethell was said to have been in perfect health. Crowley had only recently returned to London and was often a guest of novelist W. Somerset Maugham at the club. Or so Beynon claims. Beynon attributes seven deaths on Crowley. Actually, at the time, the press seemed to have blamed the 'Curse of Tutankhamun' for the deaths and speculated on the supernatural powers of the ancient Egyptians. Certainly there were links between the elite, Egyptologists and Crowley. These are commonly known and have given rise to all sorts of strange and often false theories. For example, I once attended a lecture where the presenter claimed that the then British Museum Egyptologist, Wallis Budge, got ideas about a headless god through talking with Crowley. Actually, simply by reading Budge’s work it is easy to find out that this is not the case, but never let the truth get in the way of a good story. So how much of Beyon’s story holds weight? Many people regularly dined at the Bath Club. Maybe Somerset Maugham was the killer! We don’t actually know what killed Bethell. He could have had a heart attack. And the Curse of Tutankhamun story, the claim that those who disturbed the king’s tomb died from unnatural causes, is also highly speculative. The vast majority of those involved in the excavation lived out a natural lifespan. Nevertheless, the link between Bethell, and Carter, and the Burlington Fine Arts Club is all very interesting. And we have some of Bethell’s objects. I haven’t seen it, but according to an online catalogue there is a letter in Griffith Institute, Oxford which relates to Bethell claiming to have to sell his Egyptian collection due to lack of money (Griffith Institute File NEWB2/068). A bit sad. We have 21 items associated with Bethell. These are interesting, but perhaps not great works of art. They include fragments of New Year vases, dress ornaments and a Coptic cross. And, a faience inlay and fragments of fish dishes from the royal site of Amarna (the place where Nefertiti lived over 3000 years ago). I have been particularly interested in the fish dishes. The pieces are very pretty and there isn’t much known about them. I haven’t been able to find any complete examples in any collections. Basically what are these for? Both the objects and their histories, the people who were associated with them, are all interesting. At least I think so. [i] Mark Beynon. Murder, Black Magic and Tutankhamun in the 1920s West End. The History Press. It seems a bit mad here. That’s the refrain, one I also hear from elsewhere in the University, so we are not alone. Lauren who runs our shop, held her annual Christmas Gift Shop sale on 16th and 17th November with 10% off exclusively for staff and students. This was very successful with lots of goodies bought! We would like to thank you all for your continued support as every purchase in our gift shop helps support our museum! Our volunteers and staff have won several awards. Again! First for the Out of School Hours Awards. The Young Egyptologist Workshop staff were shortlisted in the Learning Outside the Classroom Innovator category in the national Awards for Outstanding Contribution to Learning Outside the Classroom (LOtC). The awards recognise those people who have had a significant impact on the lives of children and young people through their commitment to providing exciting and inspiring learning outside the classroom (LOtC) opportunities. Since January 2002, The Egypt Centre has been running the Young Egyptologist workshops for children who would not normally visit a museum, let alone one on a university campus! 14 children each month are offered a place on the Young Egyptologist 2-day fun-packed course. Schools from Community First Areas, with a high number of children who are disadvantaged socially or economically, are targeted which supports the Welsh Government’s Anti-Poverty agenda. The workshops were used as an example of good practice of tacking social injustice as a case study by Baroness K. Andrews, Culture and Poverty: Harnessing the Power of the Arts, Culture and Heritage to Promote Social Justice in Wales. The museum aims to break down barriers that hinder such children taking part and so provide transport to collect the children from school and return them and also provide a buffet-style ‘party’ lunch for each child. The museum’s child/teacher evaluation shows that self-esteem is built and many children have made repeat visits with family members to show off their knowledge. Children gain skills as well as gaining knowledge of the subject of ancient Egypt. The culmination of the course is the Award Ceremony to which teachers, family and friends of the children are invited to see the children being presented with a certificate of their achievement. Each child has their ‘moment of glory’ and schools have reported that the children’s attitude to learning was transformed with an increase in motivation and attention and the quality of the children’s work improved. The impact has seen children volunteering at the museum, going into higher education and being the first in their family to gain a degree and move away from Swansea. Our workshops staff includes a Leader and three Workshop Assistants, some of whom have learning disabilities. And then there’s the Diana Awards. Given out in Diana, Princess of Wales’ name, the award is presented to young role models who are selflessly helping to transform the lives of others, going above and beyond to make a positive change in the world. As a result of their dedicated work, eight of the museum volunteers, together with Syd, the volunteer manager, travelled to Cardiff to receive the Diana Champion Volunteer award from Rt. Hon Carwyn Jones, First Minister of Wales. We are incredibly proud of our volunteers. And on some other good news Wendy, the assistant curator, got a really nice email from another museum whom she’d helped with advice. This resulted in them getting a grant for a project. It is so nice when people say thank you rather than just taking your ideas and taking the credit. So thanks for thanking us. It gives us a lift. I have been taking pictures of artefacts for a book on daemons in the Egypt Centre. We have several lurking! Taking decent pictures of them has been taking more time than I thought. For the ancient Egyptians daemons weren’t quite the same as what some of us moderns might expect. Daemons could be either good or bad, they were very similar to the dead, and… well you’ll have to read the book if it’s ever finished. 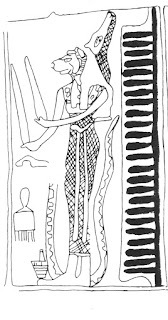 One of the most popular daemons then and also popular with our volunteers was Bes who looked after women and children and was connected with sexuality and the solar. This bandy-legged, leonine creature was often depicted with a sticking out tongue. He apparently liked to party, or at least is often shown celebrating, playing a hand-drum and dancing. The daemon publication is intended to be for both the general public and for academics. When we take on projects we try to cover as many of our core functions as possible, ours being widening participation (getting as many as possible involved in the university), preventative conservation and education (education in its widest sense, not just learning skills and facts). Of course sometimes these things contradict one another, for example widening participation includes allowing as much access as possible to the collection to all, including handling and that goes against preventative conservation. But then, in order to keep objects safe they would need to be kept in the dark in environmentally controlled conditions rather than not put on display. A sort of aside but related. Several years ago we had a lady in who wanted to free the souls of the deceased who ‘haunted’ the objects in the Egypt Centre. So, with widening participation in mind we decided she should be allowed access to the store to carry out her wishes. A few incantations later and she went away happy. And up and coming, Saturday we have our Murder Mystery masterminded by Sam, our education officer. The outline of the story being: it’s 1922 and Henry Wellcome has just discovered a new tomb of a previously unknown Pharaoh with rare and beautiful artefacts now destined for display at the grand opening of his new museum. As the archaeological team and their honoured guest gather to celebrate their historic discovery and the upcoming opening of the new museum, a mysterious death shatters the evening’s festivities! Did Henry Wellcome discover more than a long lost tomb? Could this be the Pharaohs Curse? A fun packed evening, we hope. While this news update seems to have much to do with daemons and the dead, I want to say loudly- the Egypt Centre is not scary. Please visit. Yes the things belonged to long dead people, and a lot of our stuff is from tombs (much food for an ethics debate). But as is often said, it’s the living you need to fear. Monday. Wendy spent the day getting ready for Tuesday and importantly preparing the condition reports for the student handling session next Monday. The preparation always takes much longer than the actual session. Five objects have been chosen, each of a different material, illustrating technology and material culture of ancient Egypt. The handling sessions and close examination of the real objects is always a favourite session for students and the reason some come to Swansea to study! We had a group of MA Egyptology students round and I gave them a tour of the Egypt Centre. I say tour but as I tend to burble on a lot they only heard about 4 objects. 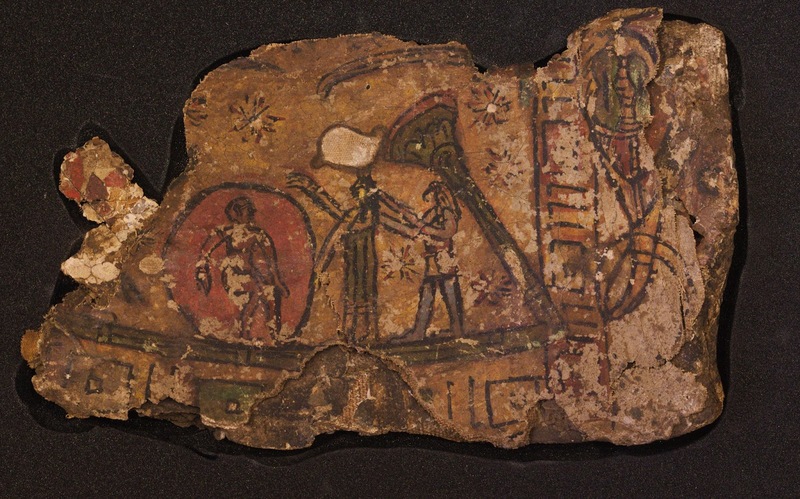 They did hear about the love story between the previous curator and a deceased head of Classics at Swansea, which is integral to how the Egyptian collection came to Swansea. Yes really! I am hoping the students were enthused enough to come back and visit us and learn about more objects. Tuesday. Wendy and I staffed the Egypt Centre stall at Staff Benefits Roadshow, Swansea University and we met lots of people we hadn’t met before including ISS staff. It was worth it to meet you all. We do try and benefit staff in having events for adults (including wine tasting a murder mystery and a photography event) and we keep the children of staff amused through events for children. And, I don’t know about you, but I find it therapeutic to visit museums. It gives a sense of perspective. That lady musician who lived 3000 years ago loved and laughed, sang, had hopes and fears, just like all of us. But back to normality, when we got back to the museum apparently the school had come and gone. They arrived at the Centre an hour late as they had confused us with Swansea Museum. This happens all the time. Our advertising budget is small and Swansea Museum is the longer established institution, in fact the oldest museum in Wales. Matching orphan labels to objects (warning, nerdish stuff). Wellcome label 243552 was found separate from its object (Henry Wellcome’s agents gave artefacts accession numbers but some of these have been separated from artefacts). But the Wellcome Institute in London has useful documents. Back in 2000 I visited there and made a few notes. Looking back over those notes I found a reference to a 1930s notebook (‘Miss Borer’s notebook’) which states that Lot 52 was a Black basalt mould measuring 4 ½ by 2 inches purchased at Sotheby’s on 22/10/1934. We have six basalt moulds in the collection. But only one with that measurement-result! EC656. When we look at photocopies of the sale catalogues of that date (some of which we have in our museum library) we see that this had been the property of Mansoor Abd Essayid. The catalogue says he was an official of the Egyptian state railways, Cairo. Unfortunately we don’t know where he obtained his moulds. And, if anyone is interested you can attend these lectures. The Friends lectures have a small cost, the latter are free. Our Museum Volunteer Manager Syd Howells gave a successful talk on the history of the Egypt Centre and the collections' origins to a church group in Tycoch on Thursday evening. Our volunteers have been super busy this week with large school groups almost every day and of course, all schools chose the mummification activity. We really couldn’t manage without our volunteers. Quote from a child visiting the Centre on being helped to take his coat off ‘I like it here, it’s like a five-star hotel’. Dear all, we thought you might like information from us, telling you a bit about what we do. We are now open again and have had a really busy week with around 60 children per day. This was from a school who had never visited us before. We are taking tons of school bookings, into next year, from as far away as England! 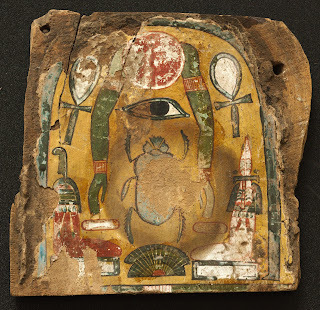 We are also taking lots of bookings for ‘Frightful Pharaohs’ Halloween Half Term workshop, a great opportunity for children aged 6-10 to learn and have fun in a museum setting: http://www.egypt.swan.ac.uk/whats-on/ So book now if you want your child to take part. On Monday Wendy and Syd had a meeting with Human and Health Sciences regarding a proposed joint project on health and well-being. Watch this space! Our very own Lauren gave a talk at Bristol all about her experiences as a volunteer at the Egypt Centre. 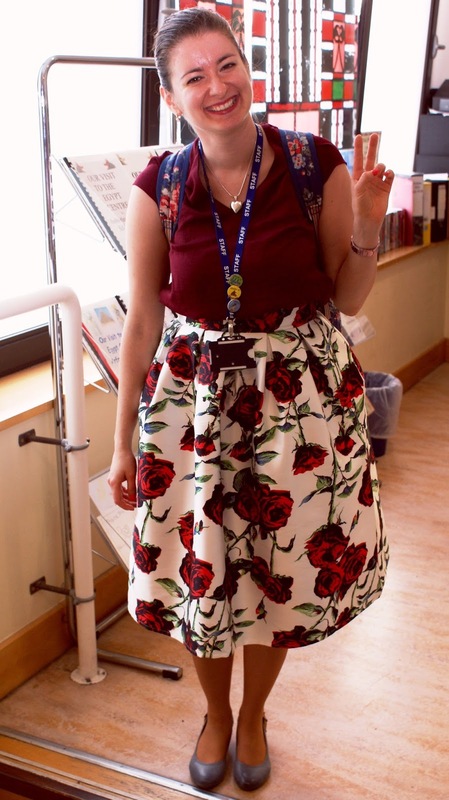 For those that don’t know Lauren she originally came to us as a work experience student from school, went on to Swansea to study Egyptology, then did the MA in Museum Studies at Leicester (very prestigious) and is now employed as our shop manager. On Wednesday Sam had a very successful meeting with the Student Union. We are hoping to work with them more in the future. Thursday Syd went over to the Department of Classics, Ancient History and Egyptology and told them all about the Egypt Centre. He was so persuasive that several have agreed to volunteer. We are really short on volunteers to deliver activities with schools, so if you know anyone who would like to volunteer please contact us. Full-training is given. I have been ploughing through some orphan labels- mainly Wellcome labels and also lot numbers which have got separated from their objects sometime between 1971 when the collection came to Swansea and 1997 when I started here. The Wellcome numbers are those which were given to the items years and years ago by Sir Henrey Wellcome, who was the original owner of the bulk of the collection. He bought lots of objects at auction, hence the lot numbers. This will take forever, but the intention is to do a bit at a time. If I find anything interesting I will let you know. Ken Griffin who used to be an undergraduate volunteer with us but then rose to the dizzy heights of lecturer has just had his article which includes one of our shabtis. The citation is: Kenneth GRIFFIN. 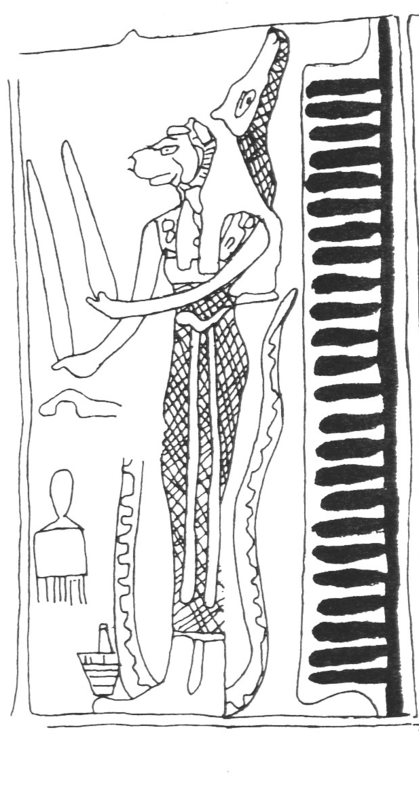 – ‘The Ushabtis of the Divine Adoratrice Qedmerut’ in Benoît LURSON, 2016 De la mère du roi à l'épouse du dieu, Von Der Koningsmutter Zur Gottesgemahlin, pp. 145–155. And if you want to know what a shabti/ushabti is, it is a servant figurine to do the work for you in the afterlife. Well who wants to work when they’re dead? Expect more news anon and if you do want to visit we are open Tuesday to Saturday 10am to 4pm. We can also arrange special tours and events for you by appointment. Inspired by Kasia Szpakowska's talk for the Friends of the Egypt Centre last night, I thought I would introduce one or two artefacts in the Egypt Centre which may have Amduat influences. Kasia's talk was all about the Amduat, the ancient Egyptian afterlife book which shows the journey of the sun-god Re through the afterlife of the Duat. The earliest complete depiction known is from the tomb of Tuthmosis III (1479-1425 BC). Unfortunately, we don't have any pure Amduat scenes in the Centre but during the Third Intermediate Period (1069-747 BC), Amduat scenes influenced the afterlife scenes shown in tombs, coffins and papyri. We do have some coffin fragments and a complete, coffin with Amduat influence. So, here we have W648: It shows the sun-disk in the morning embracing the scarab. Very similar scenes are shown on New Kingdom copies of the Book of the Dead Spell 15, but there a female figure usually embraces the sun-disk. By the Third Intermediate Period, it is the male god Osiris with elements of Shu from the Book of Caverns who does the embracing. And, by this date, Osiris is more closely linked with the scarab. In Amduate texts it seems that Shu is the god who reaches towards the scarab. Hepet-hor, She Who Embraces Horus. This divinity is almost inseparable from Osiris, guarding his judgement hall. She also tends to appear where Osiris and Re 'get together' in order to renew Re. She does appear on an Amduat Papyrus in the Nelson Atkin Museum of Art, Kansas City, where she holds up Osiris. Then there is the mound scene on our coffin, not unlike the Amduat mound of Sokar with the snake and rebirth connotations. And, Sokar was very much associated with Osiris. While these examples are not entirely Amduat inspired, and several also have Book of the Dead or other Otherworld book influence, they also have some similarities with the Amduat. Any mis-attributions, mistakes etc. are of course mine, not Kasia's! This large crescent-shaped piece of flint is flaked all over. It has one concave edge 100 mm across and some cortex (the outside of the original flint pebble or slab) is visible. 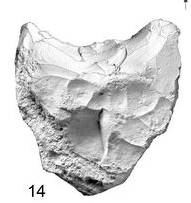 Hollow scrapers are usually found in the Thebes area and seem to be Middle Palaeolithic (around 300,000 years old). This example is from Armant, 12 miles South of Thebes. 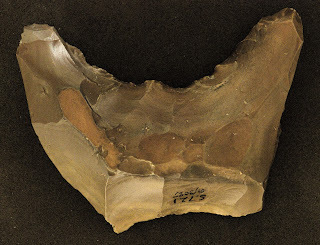 The brown patina shows it to be Palaeolithic. Such items were described by General A. H. Lane Fox Pitt-Rivers in 1882. In 1921 Seligman suggested that these were probably prepared cores with the hollow retouched. 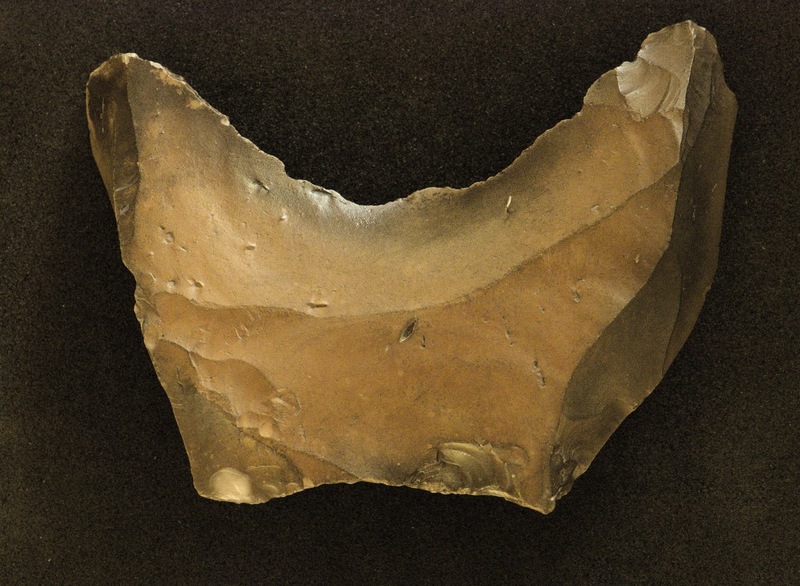 One can imagine that they may have been used to scrape cylindrical hafts for other artefacts. However, what these were actually used for and why they have only been found around Thebes remains a mystery. 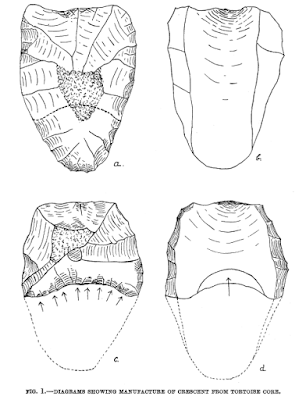 Outside of Egypt there is a similar example from the Acheulean of La Grande Vallée at Colombiers (Hérisson et al 2016, fig. 22). David Hérisson, Jean Airvaux, Lenoble Arnaud, Daniel Richter, Emilie Claud and Jerome Primault ‘Between the northern and southern regions of Western Europe: The Acheulean site of La Grande Vallée (Colombiers, Vienne, France)’ Quaternary International, 2016, 108–131. Pitt Rivers, L. F. 1882, ‘On the Discovery of Chert Implements in Stratified Gravel in the Nile Valley Near Thebes’, Journal of the Anthropological Institute of Great Britain and Ireland, 11, 382–400. Seligman, C.G. ‘The Older Paleolithic Age in Egypt’, Journal Royal Anthropological Society of Great Britain and Ireland, 1921, 51, 115–153. Paulína Šútorová has completed her BA and MA degrees in Egyptology at the Department of Arts and Humanities at Swansea University and is shortly to undertake a PhD. “My love and fascination for the history of Ancient Egypt started at an early age, when during my holiday in Egypt I had the chance to see the most famous ancient treasures, which the country has to offer. By the time I graduated from high school, the chance to study Egyptology at university became the only logical solution to satisfy my growing passion for this subject, and that is how I ended up here at Swansea University. During my undergraduate studies in Egyptology I realised, that one thing is to study this subject in theory and another is to put all your knowledge into practice. For that reason, in my second year, I decided to join the Egypt Centre as a volunteer on the 8th October 2014. From then on I mostly volunteered during Wednesdays and when my university duties allowed me to spend more time in the museum, I was always happy to come in whenever it was possible. From the two galleries, the House of Death became my home, my shelter, my “House of fun” (©Yuval), where I met many nice and sweet people both local and international. As I like to say, I found my second family here, who broadened my knowledge of Ancient Egypt even more not only by introducing me to the objects of both galleries, but also by training me in the three major activities of the Egypt Centre – the mummification, senet and material board. For more than three following years, I worked as a Gallery assistant. My main job was to greet visitors and to show them around the galleries. Furthermore, I assisted our Educational Leaders, mainly the Wonderful Roger Jones, whom I shadowed when he taught schools various lessons about Egypt. His hilarious jokes such as “Gudja, gudja” (Roger’s sacred words, which according to him should be recited by the sem-priest during the Opening of the mouth ritual) became popular and I also started to use these jokes now myself, when I demonstrate the activities. Together we started to be recognised as the “Dream team”. http://www.egypt.swan.ac.uk/. Simple theme. Powered by Blogger.